I love everything coconut, but the coconut milk sold in the carton at the stores are full of, well, gunk. Most contain gums and synthetic vitamins and carrageenan. I am not a fan. I created a quick video last year on how to make coconut milk at home, which I have included below so you can see how easy it is to make! Really you guys, don’t be intimidated, you’ll love how simple it is and it tastes much better than store-bought! Give it a try. All you need is shredded coconut (I buy Bob’s Red Mill Shredded Coconut on Amazon and use so much of it I add it to my Subscribe and Save once every other month and get an additional 15% off of my entire order so it’s even cheaper), hot water, blender (I use a Blendtec, but any blender will work), reusable cheesecloth, big bowl, 32 oz. mason jar or 1-liter glass pitcher or 2-liter glass pitcher if you have more people in your family and you want to double up the recipe. Line a big bowl with doubled up cheesecloth. Set aside. Add 2 cups shredded coconut to a blender. Pour in 4 cups of hot water. Blend for about 3 minutes or until the oils have separated from the coconut and it becomes creamy. Pour everything from your blender into your cheesecloth lined bowl. Gather your cheesecloth and squeeze all of the liquid out of the cheesecloth. This is your coconut milk! Pour it into a 32 oz. mason jar or glass pitcher to store. You can add 1 tsp. of vanilla extract + a pinch of sea salt or other flavors of your choice if you so choose. Once cold, the good-for-you coconut fat or cream will separate and harden at the top. Just give it a good shake each time you use it or skim the coconut cream off to make coconut whipped cream or to use in dishes like curries. It will last for about 5 days in the refrigerator. About 50% of fatty acids in coconut is lauric acid. Resent research shows that in the body lauric acid gets converted into a highly potent anti-viral, anti-bacterial and anti-fungal substance called monolaurin. Such pathogens as candida albicans, helicobacter pylori, HIV virus, measles virus, herpes virus, cytomegalovirus, Epstein-Barr virus, influenza and many others are susceptible to monolaurin. Lauric acid is also one of the natural ingredients of human breast milk, protecting the baby from infections. Other fatty acids found in coconut are caprylic and myristic acids, which also have pronouced anti-viral, anti-bacterial and anti-fungal properties. For example, caprylic acid has been in use as an anti-fungal, anti-candida supplement for decades in the form of capsules and tablets. What to Do with the Leftover Pulp? Make coconut flour! Spread your pulp out on a baking sheet and bake for approx. 1-2 hrs. on 200º, (you’ll know it’s done when the pulp is dry). You can also use a dehydrator if you have one. Once it’s dried out, pulse in a blender or food processor and store in a mason jar. It will be drier than regular coconut flour so keep that in mind when using it. 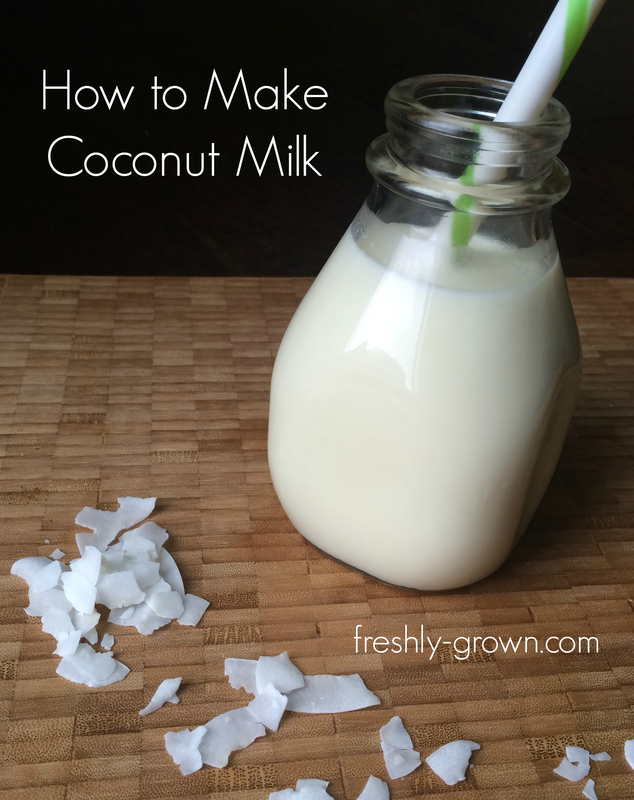 Do you make your own coconut milk?